- J. R. R. Tolkien is known with many other names: J, John, Ronald, Tollers, JRsquared, Ruginwaldus Dwalakôneis, Arcastar, "Eisphorides Acribus Polyglotteus, orator Graecorum", N.N, Fisiologvs, Kingston Bagpuize, Oxymore, Raegnold Hraedmoding . There was a time when I wanted to read all of Tolkien's books: from his Middle Earth folklore to every anthology. Alas, I was not able to read all of them, because by the time I wanted to buy them, there were no more copies left. Luckily I was able to buy a few of his books outside the Lord of the Rings saga. 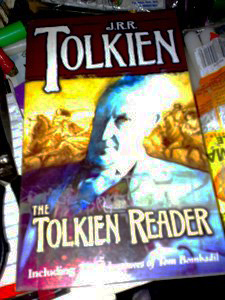 The Tolkien Reader is one of them and I am still delighted to have had read this book. This book is composed of stories of varied themes and focus. It contains an introductory essay by Peter S. Beagle entitled Tolkien’s Magic Ring; a short play entitled The Homecoming of Beorhtnoth Beorhthelm's Son; an essay On Fairy-Stories; Leaf by Niggle and Farmer Giles of Ham; and the collection of sixteen poems known to readers as The Adventures of Tom Bombadil. Most of these works appeared in other publications except from the Beagle essay and The Homecoming of Beorhtnoth Beorhthelm’s Son. And most of them are highly entertaining in their own way. But the part that I liked best is Leaf by Niggle, which is some kind of a surreal adventure of a man whose dreams are yet to be discovered. As a teaser to the whole book I can give you an excerpt from "Adventures of Tom Bombadil"